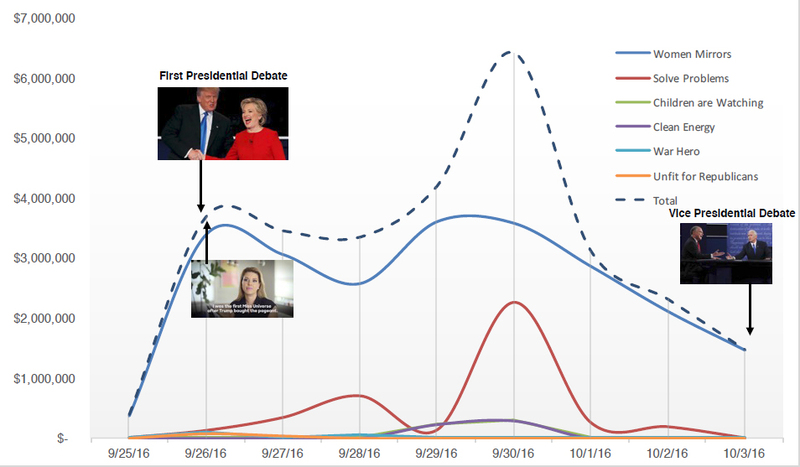 iQ Media have released a report analysing the ad spend of the official Trump and Clinton campaigns over the last 30 days. The data shows that, unsurprisingly, the candidates are focusing their spend on local TV stations (rather than national networks) in battleground states. It also shows that, as I wrote last week, Trump is outspending Clinton the final weeks of the campaign. One thing that jumped out to me was the fact that Trump is airing a number of different TV commercials at a relatively similar weight, whilst Clinton is only really pushing one. This indicates to me that Trump is varying his message depending on the political context of the state (you can get a flavour of his ads here), but Clinton’s campaign feel they’ve landed on a piece of creative that is moving the dial. The power of the creative comes from the authenticity with which the cultural insight – that young women are often put under huge social pressure to look and behave in a certain way – is brought to life. Despite the fact that it has over 5 million views (the most popular film on her YouTube channel), it will come as a surprise to some that her campaign isn’t varying the copy from state to state; in 2012 there was huge amounts of hype around the way the Obama campaign varied their ads depending on events and the demographics of the viewer. But the Clinton campaign’s research must show that ‘Mirrors’ is working and therefore, in a typically cautious way, they’ve decided not to take a risk on other creative.